The Notrax 850 Niru Cushion-Ease GSII Anti-Fatigue Mat is a heavy duty, durable safety mat constructed of nitrile rubber for survival in even the harshest environments. Drainage holes provide for moisture escape. A coating of silicon carbide grit offers superior traction. The Notrax 850 is part of a complete system of mats that interlock together to create custom solutions on site. Optional Notrax 551 ramps and connectors create beveled edges and complete the system. 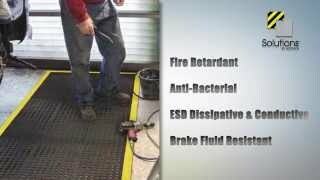 The Notrax Niru Cushion-Ease anti-fatigue mat is designed to resist chemicals, cutting fluids, oils and grease, making it an excellent choice for industrial settings where traction and drainage are critical. The Notrax 850 Niru Cushion-Ease GSII Anti-Fatigue Mat is available as a single mat in two sizes, 3' W x 3' L or 3' W x 5' L.